Preheat oven to 350ºF and spray of line a muffin tin. Sift together flour, baking powder, and salt. Whisk milk and egg whites in a medium two. Put the sugary and lemon zest in a bowl and rub together until the sugar is moist and fragrant. Add butter. Beat in extracts, then add 1/3 of the flour. Beat in half of the milk egg mixture, then beat in half of the remaining dry ingredients. Add the rest of the milk and eggs and add the last of the dry. Place the batter into the cupcake tins. Bake for 18-22 minutes or until a toothpick inserted in the middle of a cupcake comes out clean. event and it is gonna be a blast!!! I can't wait to share with you! Sophie! I just love lemon desserts. 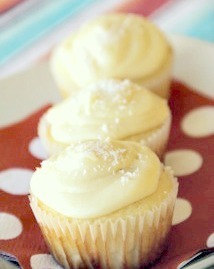 And these cupcakes looks so beautiful - so much fresh lemon flavor.. perfect for summertime! I will be making these for sure! Love cupcakes and love lemon... win win situation here. I hope you'll link up at Off the Hook. Thanks so much for the invite, Lauren! I'm headed on over! Have a great weekend! Those look delicious! I love lemon anything! These look delicious. I've pinned them. I'm going to try the recipe this weekend. These were very good and everyone at the party really enjoyed them! The frosting made WAY too much though. I could've cut it by at least half and still had plenty. Thanks for the recipe!